Linux containers (LXC) is a lightweight virtualization technology built into Linux kernel. In my previous article, Debian Virtualization: LXC Application Containers, I have detailed the steps to configure and run a simple application container using LXC. LXC application containers are very lean and consume strictly the resources the application requires. This is in sharp contrast with other virtualization technologies which are running a full Linux distribution in VM. The container uses its own file system, built by mounting read-only the relevant directories from the host file system. The host is an older computer running Debian 7 “wheezy”. The virtual machine is controlled through GNU screen if the VM was started automatically at boot time, or through a regular xterm. One thing I left out was the networking stack. In my Lighttpd web server example, the VM uses the same networking stack as the host. This could become a problem if someone manages to compromise the web server: the intruder could then probe the networks connected to our host, in search for the next victim. The virtual machine is connected to the bridge through a mechanism called “veth pair”. This is a sort of a tunnel between host br0 device and eth0 device in vm1. Every packet going in on one side will be transfered to the other side without any modifications. The network addresses used on the tunnel are 10.10.20.1 for br0 and 10.10.20.10 for eth0 in vm1. root@debian:/# export PS1="\e[01;31m\h:\W \u # \e[00m"
I can start now Lighttpd (/etc/init.d/lighttpd start) inside the container, and verify it is working by pointing my browser to 10.10.20.10. With forwarding enabled in Linux kernel, we can access in this moment our web server from the outside network. In many cases the setup we have so far would be sufficient. We can however improve the security of the setup by enabling netfilter firewall in Linux kernel. The user-space tool to control it is iptables and it is probably already installed on your machine. In case it is not, the command is apt-get install iptables. 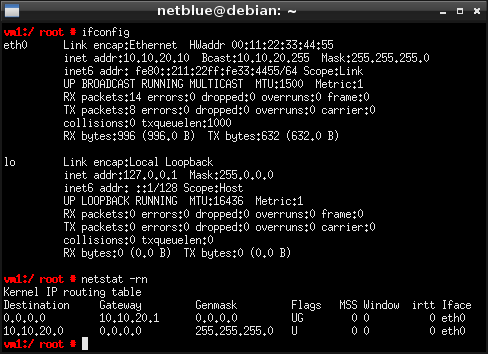 I put all the network configuration into ~/vm1/network.sh. The script is run before the virtual machine is started. Configuring an LXC virtual machine is not difficult, it does however carry you through several Linux subsystems, starting with LXC and CGROUPS, building up filesystems and managing the controlling terminal, network bridges and firewalls. As mentioned in my first article, LXC is basically a chroot on steroids and it doesn’t promise anything regarding security. This is changed on production boxes usually by setting each virtual machine on its own isolated network, running mandatory access control (SELinux, AppArmor) on the applications inside the containers, adding grsecurity and PaX support to Linux kernel, and probably a number of other things. 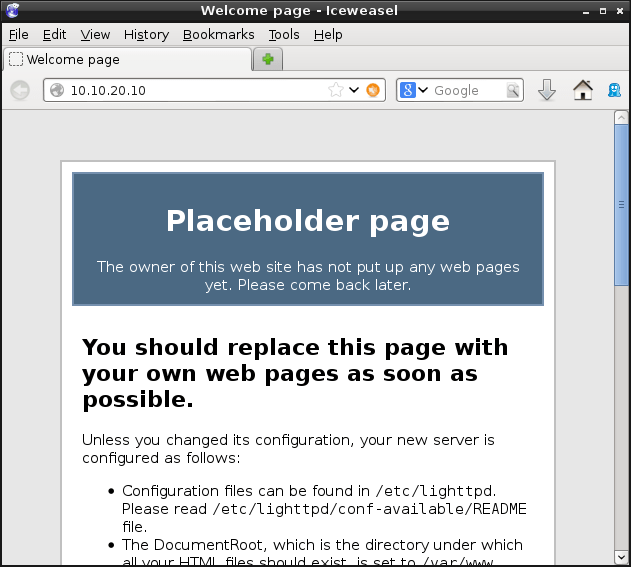 This entry was posted in Linux, Networking, Virtualization and tagged Debian, Firewall, LXC on August 25, 2013 by netblue30. Thanks, I guess old habits die hard! how am I supposed to open a port from the container to the the main network interface ? Let’s say I have a mail server running inside a container. the container isolation (all the LAN+WAN host network is available from the container). I’m not an iptables expert so I’m quite stuck. Your email server accepts connections from outside, it also needs to connect outside. I think you cannot do it without breaking your container isolation. I am also not an expert myself either, I can only guess in this case you need to run your server in something like a DMZ (http://en.wikipedia.org/wiki/DMZ_%28computing%29). I did try through the article on debian (https://wiki.debian.org/LXC/VlanNetworking) but it doesn’t provide the runtime command as ifconfig or with ip-*. 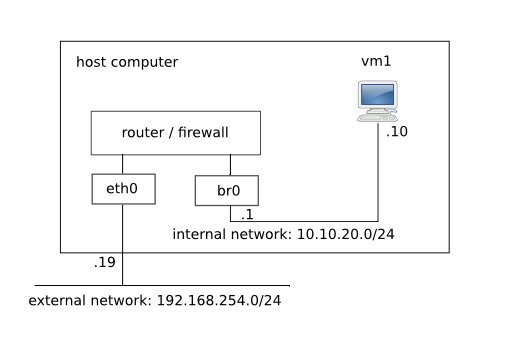 How to allow vm1 to access external network (internet) through eth0?